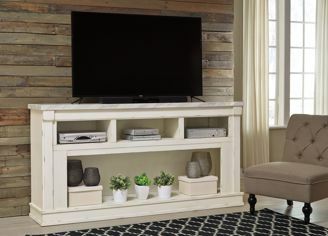 Entertain the art of modern farmhouse living with the Becklyn TV stand with fireplace option. Its open concept design is a refreshing sight, as is the “chippy white” distressed finish loaded with charm. Compatible with the W100-22 large fireplace insert, this simply beautiful TV stand that fits a 75" television is so tuned into your needs.